If you’ve been to a grocery store recently, there’s no denying that Thanksgiving is only a week away. Right in the entrance are piles of canned pumpkin, trays of cookies, bags of cranberries, and all sorts of pies displayed. Anyone who loves to eat delicious food and spend time with family looks forward to this holiday for months; but on the other hand, anyone who breaks out just looking at a cookie will dread the holiday season. 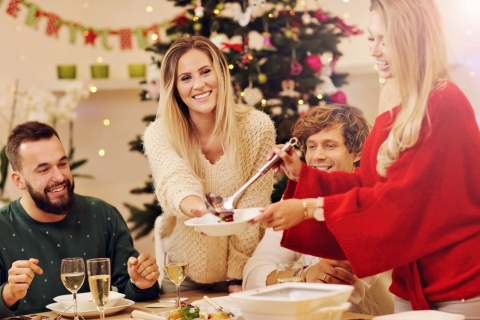 So, as you’re baking up a storm in the kitchen and attending various holiday parties and New Years celebrations over the next two months, watch out for these four ways this time of year can cause breakouts, clog pores, and leave you with dry, dull skin. 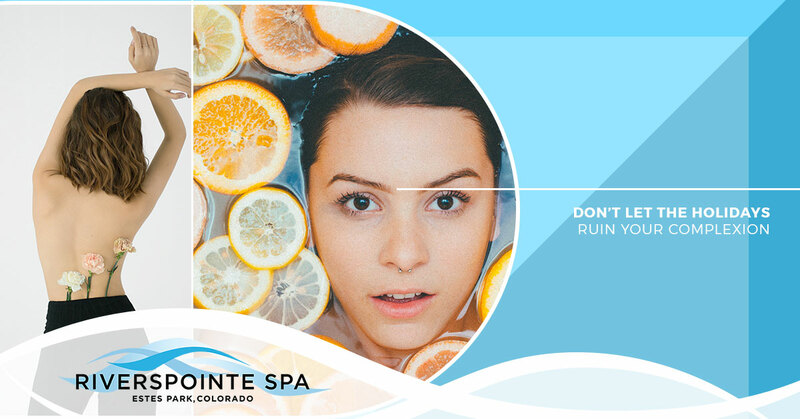 If you’re looking to give your skin a head start, stop in at Riverspointe Spa in Estes Park for a facial! We offer microdermabrasion, anti-aging, purifying facials, and more! Your skin will thank you! Pie, candy, cake, cookies, and even fruits like grapes — they’re all packed with sugar! Even though the holidays are full of sugar, your skin should stay as far away from it as possible. Sugar does two things to your skin: causes inflammation and sugar binds to collagen. Inflammation can cause your skin to appear red and flushed. When sugar binds to collagen, it will stiffen and age the skin. If you want to avoid sugary treats, opt instead of healthy fruits like raspberries. And if you’re feeling indulgent, dip them in sugar-free Cool Whip. Everyone enjoys ringing in the new year with a glass full of champagne, right? Or sipping a glass of wine at Christmas dinner? Or enjoying a pumpkin beer at Thanksgiving? The downside is that alcohol dehydrates your skin and can dilate the blood vessels, making it appear red. Instead, try opting for a red wine spritzer, which is sparkling water with a splash of red wine. The benefit of this drink is that red wine has antioxidants which are good for your skin! Shopping, cooking, traveling, attending parties, along with the long to-do list you already have means a very busy schedule. As much as we intend to keep up with our skin and facial routine, it can be hard with so much going on. Many times, our skin care gets pushed to the side, including exfoliating, moisturizing, and cleansing. When your skin goes weeks without regular maintenance, no wonder you start seeing dull skin. As busy as your schedule is, at least try to remove all makeup every night and give your skin a good exfoliating facial at least once every two weeks. For anyone who is in a hurry and wants a quick fix, visit Riverspointe for a 30-minute express facial. There’s no doubt that Estes Park is cold, especially during the late fall and winter months. With dry, cold air, it can leave your skin crying out for moisture! And to remedy this, that’s exactly what you need to give it. When you wash the makeup off your face at night, be sure to give it a generous layer of moisturizer that will help replenish the skin. And if you want to get away from the cold, visit our day spa for a relaxing facial. Riverspointe Spa loves celebrating the holidays, but understands that it can be hard taking care of your skin at the same time. To ensure that your skin is radiant and healthy throughout the season, choose from a variety of facials at our day spa and salon.